No, Governors-General do not make headlines, thank God (i.e. Gough). 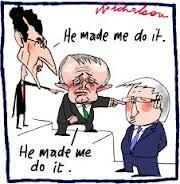 Godwin Grech (his parents had a sense of humour) thinks he remembers an email from ‘PMO’ about the PM’s car dealer mate. Would you believe he’s referring to the Prime Minister’s Office, a lovely conceit indeed. Imagine the oak desk and chairs having a meeting and issuing instructions to the computer? Bureaucratic shorthand and evasion were matched by low insults traded in the people’s parliamentary chamber in the nation’s capital. The Leader of Her Majesty’s Opposition, The Right Honourable Malcolm Turnbull, looked particularly dodgy about his prior knowledge of said email, now shown to be false and in fact produced in Treasury’s office. Now we’re getting Machiavellian. The car dealer’s mates in high places also looked uncomfortable. Unfortunately giving them all a lie detector test would probably be fruitless. And of course, car dealer sounds so much worse than wheat farmer or kindergarten assistant. Arguments about emails look so juvenile. The plot already reads like a third rate pot-boiler with police raids and IT audits (wow) to spice it up. Meanwhile Rome (the planet) burns, as does GG’s public service career.